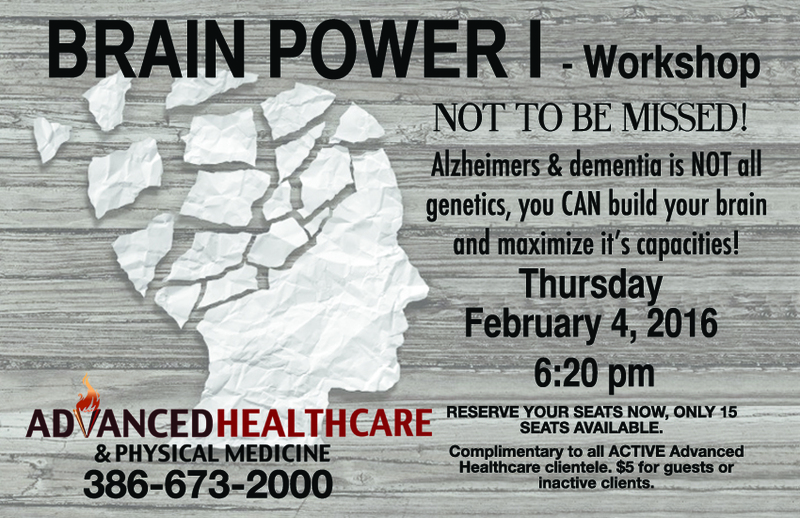 Last Thursday night we packed out our office for my newest health talk, which is POWER BRAIN (part I). We had 22 people attend and they really enjoyed it and are now applying the secrets and techniques we covered. My point, please register now for the next POWER BRAIN (part I) encore. I will be doing the same talk on Thursday Feb. 4th at 6:20 p.m.- 7:30 p.m. This is really critical stuff for your overall health but specifically your Central Nervous System. The younger you are, the more you can avoid massive problems in your future. Sadly, none of us are getting younger, so we must be diligent about the upkeep of our most important possession, our body & mind! I really feel that you’ll get a lot out of the information and teaching…hope that I’ll see your smiling faces Thursday night! We will have some nuts, cheese, crackers, fruits, veggies, and vino if you’re just getting off work and coming here for the workshop, so don’t worry about being starved! Call (386) 673-2000 to reserve your spot, we will only be able to hold 22 people!